This week I learnt about a mystery object in the museum’s collections – the mystery is not what the object is, but what the object contains. Wax cylinder recording for use with a graphophone, c. 1888. What you can see is a wax coated cardboard tube, similar in size to a loo roll, with three bands in the surface of the wax. 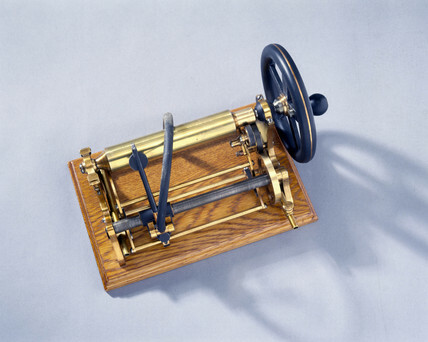 The tube was used with a graphophone, a device invented in the 1880s which recorded sound in a similar way to a vinyl record. The Museum acquired the cylinder in 1929, but without any way of playing it. The donor, a descendant of Samuel Morse, suggested that the cylinder had been used with a graphophone that was demonstrated to Queen Victoria in 1878, although he gave no clues as to what was recorded on the cylinder. These revelations spurred the museum to try and play the cylinder – with no idea what might be on it. With the help of the National Sound Archive, now the British Library Sound Archive, the cylinder was played for the first time in decades. The three marked bands you can see on the cylinder are three separate recordings. The first recording was a man speaking and then whistling. One of the other recordings is unfortunately so damaged that it is impossible to make out any words. However, the second recording is about 20 seconds long, and although poor quality a few snatches can be heard of a well-spoken lady saying, “Greetings… the answer must be… I have never forgotten.” Could this be the voice of Queen Victoria? With only circumstantial evidence to guide us we can’t say for sure, and perhaps we will never know. Listen here and make your own mind up. To find out more listen to Punt, P. I. on BBC Radio 4, 2nd October at 10.30am for an interview by Steve Punt with John Liffen, Curator of Communication. Charlotte Connelly worked on the Information Age gallery and is now working on her PhD with the museum. Thanks for the comment. The National Sound Archive are experts in capturing sounds from a variety of different media – and they worked to get the sound off the wax cylinder described above. They did a lot of work to make the recording clearer, we have the original, unedited version and it’s inpenatrable white noise with no discernable talking, whistling or anything else for that matter. Although there are pieces of software that will do things like removing ‘clicks’ and ‘noise’ what that doesn’t do is add information to fill in the gaps in the speech. So, while it may be possible to remove some of the background fuzz from this recording we can’t make the speech clearer, and the process would more than likely reduce the speech information we have to work with. Even if successsful I suppose this would still leave the problem of definitely attributing the voice to Queen Victoria. In 2005 the ‘Queen Victoria’ cylinder was investigated by the Sound Archive Project run by Professor John McBride of the University of Southampton’s School of Engineering Science. The project aims to investigate methods for the non-contact scanning of sound recordings, in particular those now unplayable by conventional means. These include sheets of tinfoil wrapped round a cylinder, which comprise the earliest recording medium. The procedure is to make a digital scan of the full recorded surface using a laser technique. This may well take many hours to complete. The Sound Archive Project brought its equipment to the Science Museum to scan the graphophone cylinder. While the exercise was technically successful, the grooves were found to be so worn, and the sounds recorded in them so weak and fragmentary, that the technique was unable to discriminate between recorded sound and background noise any more effectively than had already been achieved by conventional transcription and subsequent filtering. I listened to the Steve Punt programme and was fascinated, not least because I work with audio. I was instantly struck by the fact that the recording could indeed be made clearer, particularly by lessening the effect of the constant and regular crackles that get in the way of hearing the voice (you can see these visually if you look at the recording as a Wave file). So this is what I did. Play the mp3 above, listen again and see if you can make out these words. The only one I’m in two minds about is ‘festival’, but I think it’s clear that it’s a three syllable word. 1. It sounds as if the recording is in response to a question that’s been put. 2. It’s being addressed to a large audience (i.e. the recording might in due course be heard by a large audience, not that there would necessarily have been a crowd present when the recording was made). 3. She’s speaking on behalf of herself and others (hence the use of the words ‘we all’). 4. The festival (or whatever) is something that seems to have happened in the distant past, rather than the recent past, and would have been an event which the ‘ladies and gentlemen’ would be familiar with. My reply comes a full 2 years after the original postings and comments, but I’d like to add some details to the discussion of whether or not, this is Queen Victoria’s real voice. Firstly, we have some references by her grandchildren about her voice. Queen Marie of Romania’s memoirs are especially revealing; with her keen eye for detail, the effusive Balkan queen wrote that “Grandmama Queen” had a “bell-like” timbre to her voice, something which was noted again and again by courtiers. She also wrote that her grandmother had a vague Germanic accent, evident in all her children as well by the way they rolled their “r”s in the German fashion. The monarch’s voice was “unforgettable” and “crystal clear” even in her dotage (see Lady Walburga Paget’s memoirs), projecting grandeur for someone so tiny and elderly. She could command the attention of a room effortlessly, as befitted a British sovereign. Secondly, I was immediately struck by the enhanced version of this recording above when I amplified the volume on VLC. Oliver’s transcription is spot on, and I can hear her punctuated, rolling “r”s quite clearly, not to mention the German-sounding “CHEN-tel-men” instead of gentlemen. At first I thought that the Festival in question might be the Great Exhibition (Crystal Palace), since it was her adored late husband’s brain-child, which indeed, she had never forgotten given her many references to it in her life, but I am not aware that the term “festival” was ever synonymously applied to it, alone. Perhaps others can weigh in. Lastly, I was again struck by the family resemblence to this voice to that of Queen Mary, her grandson’s George V’s wife. It is VERY like, which you can compare here on YouTube, starting at minute 2:37. Queen Mary’s voice was of higher pitch, less assured even, but the tone and accent is identical. My conclusion is that this aged cylinder contains the only traces we have of Queen Victoria’s voice. I hope in time technology will improve so that we get the best possible digitised legacy. P.S. : Also, has the Museum seen this link about a recording sent by Queen Victoria to the Emperor Menelik of Ethiopia, in 1898? It is a staggering document about a very long and detailed recording by the old Queen, one year after her Diamond Jubilee, if it is true. Thanks for the comments vbspurs, you’ve provided us with some interesting material there. I had heard of the recording Queen Victoria sent to Emporer Menelik. I think her request that the recording be destroyed afterwards tells us something about how she thought of the technology – it must have been quite disconcerting to have, even pre-scripted, words and sounds preserved for posterity. You can also imagine that very few individuals were ever permitted to the intimacy of Queen, and only they would ever hear her voice. As a result I feel that there’s something very personal about sharing your voice in an age before sound recordings are commonplace.